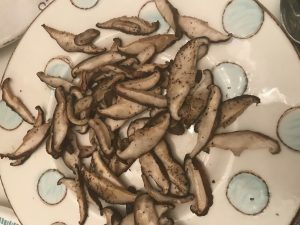 I’m obsessed with making these nutritious, and ridiculously delicious roasted shitake mushrooms. 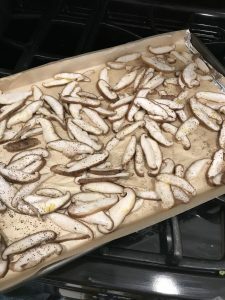 Last week, I was roasting vegetables and decided to add a container of sliced shiitake mushrooms that I just purchased from Whole Foods. I drizzled them with olive oil, added pink Himalayan salt, pepper and garlic powder and baked them for aprox 35 minutes. They turned out so delicious, (I mean really delicious) that I couldn’t wait to make another batch! Lately mushrooms seem to be all the rave, but these ancient mushrooms have long been known to have medicinal effects and are more then just the next trend. Did you know that Shitake Mushrooms provide measurable anti-inflammatory benefits? They are low in calories, contain potent phytonutrients that help keep cells from sticking to blood vessel walls and forming plaque buildup, which maintains healthy blood pressure and improves circulation! They are a great source of B vitamins, which help support adrenal function (many people with SVT also have adrenal fatigue) and they help to turn nutrients from food into useable energy. They also help balance hormones naturally. In Chinese medicine, shiitakes are thought to boost health and longevity, as well as improve circulation. And, several compounds in shiitakes have antibacterial, antiviral and antifungal effects. These include oxalic acid, lentinan, centinamycins A and B (antibacterial) and eritadenine (antiviral). In the face of growing antibiotic resistance, some scientists think it’s important to explore the antimicrobial potential of shiitakes (source). 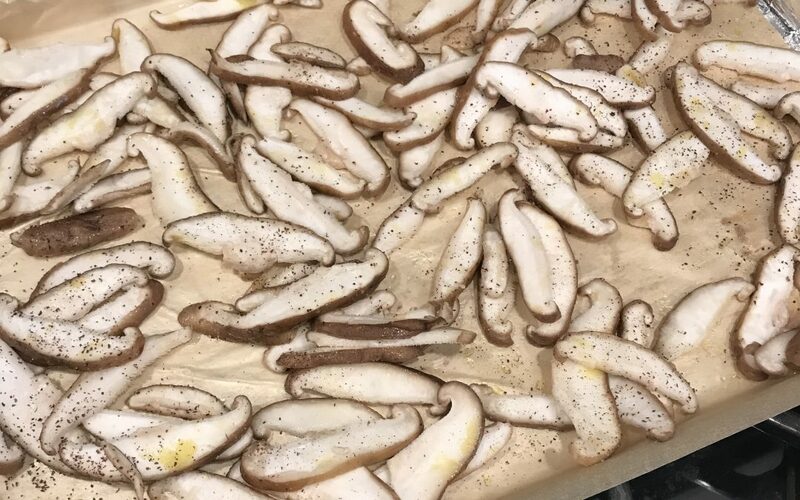 Buy pre-sliced shiitake mushrooms (to make your life super easy) or gently wash and slice yourself. If you buy them in whole form, just snap off the stem. Then, spread them out gently on a parchment lined baking tray. Drizzle with olive oil, pink salt, pepper and garlic powder. I also dressed mine with dulse flakes. Bake on 350 for aprox 35 minutes. You can bake them longer if you want them even crispier. Eat alone as a salty snack, or serve with dinner, as a side dish. You can add them to top salads, or top a soup with them.